Senate Republicans' attempt to repeal parts of the Affordable Care Act died early Friday morning, with three GOP senators -- Sen. John McCain, Sen. Susan Collins and Sen. Lisa Murkowski -- voting against the proposal. "So ... this is clearly a disappointing moment," Senate Majority Leader Mitch McConnell, R-Kentucky, said right after the bill failed. Even a last-minute attempt by Vice President Mike Pence to persuade McCain to vote for the bill failed. 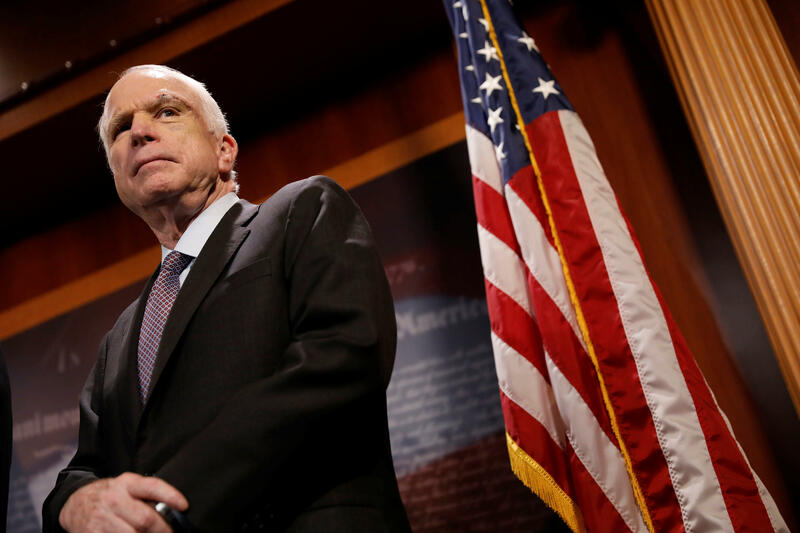 McCain was key in an earlier Senate vote on the motion to proceed with efforts to repeal and replace the Affordable Care Act or Obamacare, and many of his Republican colleagues looked to his return to the Senate as a sign that they would be able to pass some kind of health overhaul. "From the beginning, I have believed that Obamacare should be repealed and replaced with a solution that increases competition, lowers costs, and improves care for the American people. The so-called 'skinny repeal' amendment the Senate voted on today would not accomplish those goals," McCain said in a statement released after the vote. The veteran Arizona senator said assurances from Speaker of the House of Representatives Paul Ryan that the House would be "willing" to try and improve upon the "skinny repeal" bill in conference "does not ease my concern that this shell of a bill could be taken up and passed at any time." The Health Care Freedom Act would have repealed key GOP objections to the ACA, including the individual and employer mandates and the medical device tax. The bill also cut off funding for Planned Parenthood. An amendment to the bill passed on Thursday also repealed the so-called "Cadillac" tax on the most robust and expensive health care plans. President Trump, who urged senators to pass the skinny repeal bill in a tweet before the vote, chastized the three Republican dissenters and all their Democratic colleagues in a tweet early Friday morning, saying they had "let the American people down." Until hours before the vote, the bill had no publicly released text and was only known as the "skinny repeal," prompting intense criticism from Democrats who say they and the public were shut out of the process. "Why is this being rushed through this way? Why is this being done in the dark of night?" Senate Minority Leader Chuck Schumer (D-New York) said in a five-minute statement before the vote, after Sen. Mike Enzi (R-Wyoming) repeatedly denied Democrats from asking any questions about the bill for an hour. In the statement released after the late-night vote, McCain urged his colleagues to "return to the correct way of legislating and send the bill back to committee, hold hearings, receive input from both sides of aisle, heed the recommendations of nation's governors, and produce a bill that finally delivers affordable health care for the American people." The Congressional Budget Office estimated late Thursday night that 16 million more Americans would lose coverage by 2026, and premiums would increase between 2018 and 2026 by 20 percent compared with current law. But conservative critics of the bill point out it doesn't repeal other key taxes and regulations in the ACA. Republicans in the House and Senate have been criticized for not having a clearer plan in place, after seven years of Obamacare and promises to repeal it. It's unclear what the House will do next. The House GOP caucus was expected to convene to figure out its next steps Friday at 9 a.m., but that was before the latest bill failed.